Siblings form the longest thread throughout our lives and one of the most enduring relationships we will ever have. Whether bonded by blood, marriages, adoption, foster or as fictive siblings, it is our deepest connection in a family, binding us together no matter how old or young. However, for many this bond has not always been a smooth one. Because of perceived damage done by a sibling, there is often a deep gash that has never healed. We feel hate for that sibling for many different reasons, though the chief complaint is often, Mom or Dad favored him or her over us. In Mom Loves You Best, Cress and Peterson examine family rituals that can help bring adult siblings back into the fold. Through a ten-step process, readers learn through self examination the sharing of their childhood wounds in an individualized “I Hate You Story”, how to feel better about themselves, while repairing family relationships and ultimately working together with siblings through family crisis and to help aging parents get needed care. The Midwest Books Review gave a sterling five star rating of “Mom Loves You Best” in December, deeming the book a “ fine read.” See the review below. 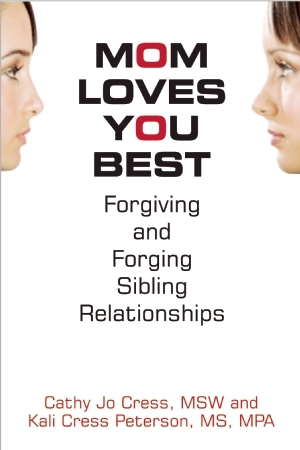 That is added to the 17 five star rating “Mom Loves You Best” has garnered on Amazon.